Check out some of the YouTube clips of RICKY GERVAIS on Inside The Actor’s Studio. June 19, 2011 update: Just discovered Banff has an official YouTube video of “Ricky Gervais accepts the Sir Peter Ustinov Award” but since it doesn’t pan to show Ricky‘s or Jane’s reaction, I think, imho, my video gives a much better viewing experience. The following is Ricky’s Banff bio. “At the turn of this century, Ricky was preparing to star and direct a pilot he had written with Stephen Merchant for the BBC, called ‘The Office’. It went quite well and a series was commissioned. It first aired at 9.30pm on Monday 9 July 2001 on the BBC. The rest as they say is history. It is the most critically acclaimed sitcom of all time becoming the first British comedy to win a Golden Globe. 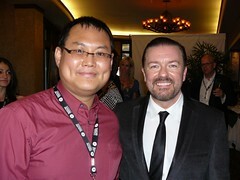 In all, Ricky has won three Golden Globes, two Primetime Emmys, and seven BAFTAS. ‘The Office’ is the most successful British comedy of all time being shown in over 90 countries with seven remakes. The NBC version is the most successful US remake of a British show for over 30 years. It reached the magic 100 episodes in 2009 and has started its first phase of syndication. Ricky won his first Emmy as Executive Producer on ‘The Office’ (US) in 2006. He won his second for ‘Extras’ in 2007. Only two British sitcoms have won Golden Globes – ‘The Office’ and ‘Extras’. Over a 10-year period Ricky Gervais has become the most influential British comedian since Charlie Chaplin. He is an award-winning stand up and his tour ‘FAME’ became the fastest selling UK stand up show in history selling an untouchable 100,000 tickets in 9 minutes! He played to 500,000 people that year including his first US tour, which was recorded as an HBO special at Madison Square Gardens. The show received three Emmy nominations. He was named in Time Magazine’s 100 Most Influential People In The World, one place behind Nelson Mandela. This annoyed Ricky who said of Mandela… “He didn’t do anything for 25 years”. He is the only guest star of ‘The Simpsons’ to also write an episode. It became the highest rated Simpson’s episode of all time on Sky One in 2006. He also appeared on ‘Sesame Street’, which he says is the highlight of his career. In 2005, Ricky turned his hand to podcasting and is now in The Guinness Book Of Records as the most downloaded internet show of all time. He was the first to charge for podcasts the following year and has now clocked up a staggering 180,000,000 shows downloaded. ‘The Ricky Gervais Show’ has been the number one selling audiobook in the world since 2006. In 2009 it was made into a 13 part animated series for HBO. It is currently being sold around the world and will air in The UK on Channel 4 in March 2010. In 2004 his children’s book ‘Flanimals’ was published going on to sell over a million copies. It is currently being made into a Hollywood movie in which Ricky will star as the Puddloflaj- a fat sweaty wobbler – (The Puddloflaj that is). The beginning of the next decade is looking good for the fat bloke from Reading too. He started the year as the first host of The Golden Globes since 1995, with an estimated world TV audience of 250 million. His new animation premiers in February. ‘Cemetery Junction’ is out in April and his new tour will spread to The US and other parts of the world. This entry was posted on Thursday, June 24th, 2010 at 1:21 PM and is filed under bwtvf, bwtvf-nextMEDIA, bwtvf2010, Canada, Comedy, Love, people, Television, World, YouTube. You can follow any responses to this entry through the RSS 2.0 feed. Both comments and pings are currently closed.